Just noticed a little mistake in the episode Fatal Extraction, quite early on in the episode, when Albert gives Del the Relate, Marriage guidance thing that came through the door, Rodney says, "Del and Raquel are not married" to which Albert replies "No, but they row thought, don't they". However, later on in the nags head, Del and Rodney are talking, when Del says "I have a wife and kid" to which rodney replies "i have a wife and... Thermometer"
Did Raquel and Del Get married off screen or this perhaps a mistake from John Sullivan. It is trivial really but quite interesting. 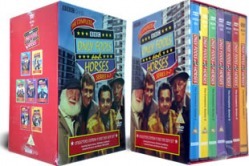 Only fools and horses website featuring Episode information, Quizzes, clips, and lots more.